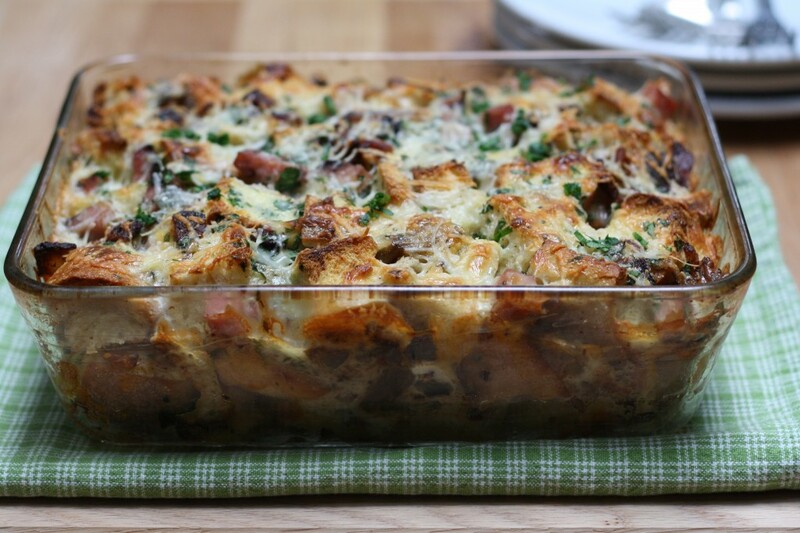 This is one of those dishes that has an awesome name which makes me want to come up with puns like: this is “strata”-up delicious. Or one bite will send out of this “strata”-sphere. But stratas are also one of the best ways to clean out your fridge and feed a crowd at the same time. Oh do you have a ton of holiday leftovers, hardly any time, and a brunch planned for New Year’s Day? 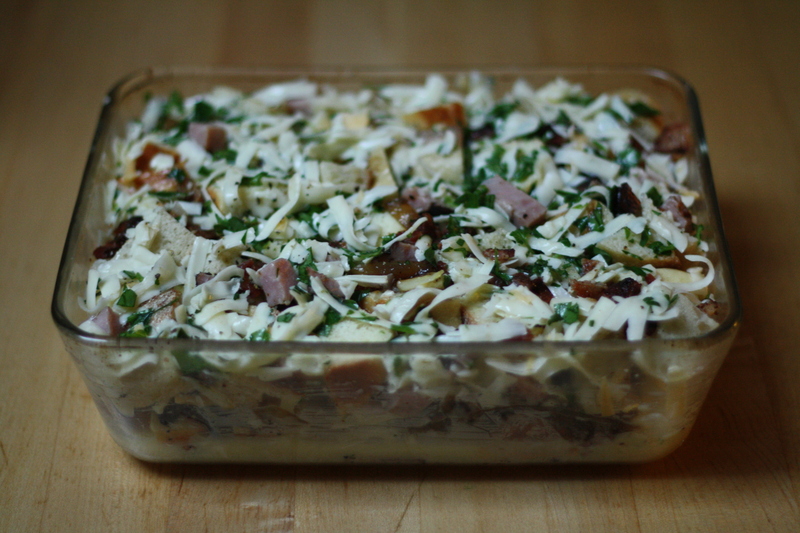 Perhaps I can recommend this make-ahead anything goes strata. 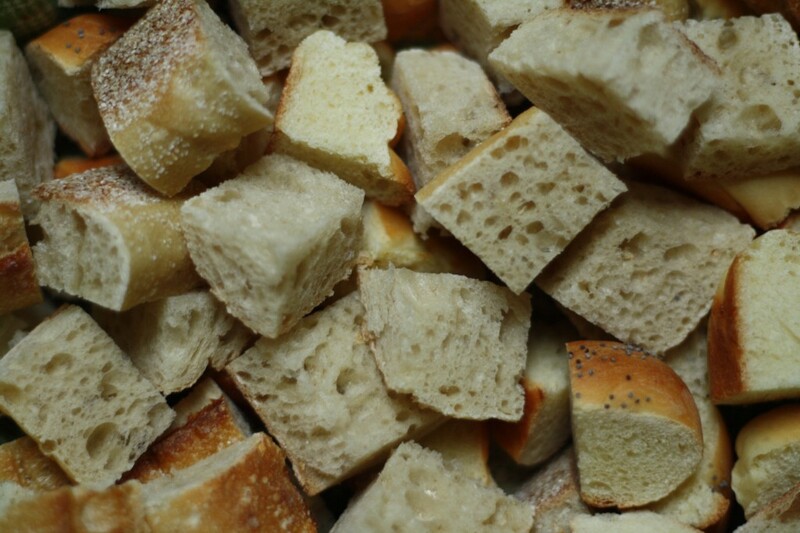 A strata starts with stale day-old bread. For the record I would like to say that any recipe that starts with stale bread and ends with a magically delicious custardy breakfast casserole has got to be worth it. It’s a good thing that putting together a strata takes hardly any effort at all. Up next is the fun part: cleaning out your fridge. Perhaps that is not the most fun but again, think about the end result. On my fridge-cleaning adventure, I found some thick-cut bacon, a few slices of cooked ham, an onion and a few different types of cheddar. Perhaps you have sausage or mushrooms or bell peppers or feta or even a quarter of a jar of olives. Whatever you’ve got, it will all bake into a glorious thing of strata. I quickly caramelized half the onion for even more flavor. My trick for caramelizing onions? A little pinch of salt and sugar which brings out the sugars and makes for perfectly caramelized onions every time. After you have decided on your fillings, the cubes of bread get dunked in an egg and milk mixture which makes sure every nook and cranny of bread bakes into custardy-goodness. Then layer everything in a baking dish. You could easily scale this up or down depending on how many you are expecting for brunch or the amount of your leftovers. The most important thing is that each piece of bread is dunked in the egg mixture. If you are short on eggs, then add a little milk. This is less of a recipe and more of a set of guidelines for strata-making. There are no real rules. It is just brunch after all. Once everything is layered, cover and refrigerate. Then get your party pants on and ring in the new year with a bang. 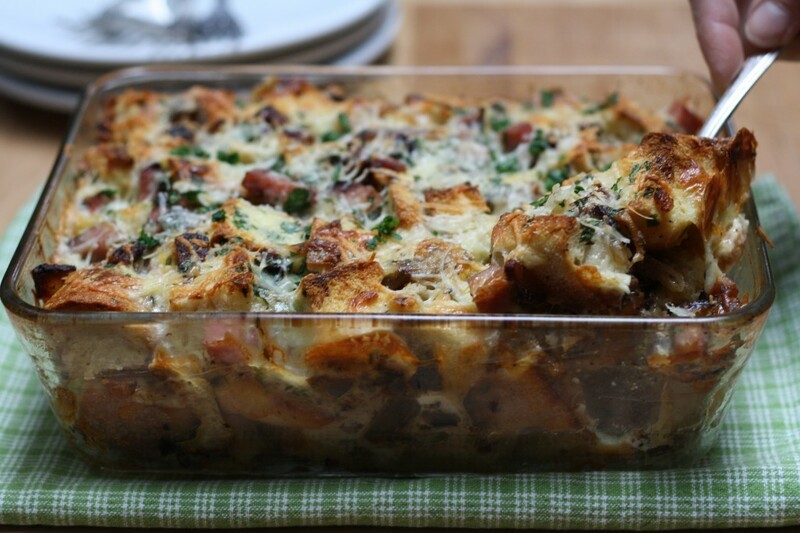 At least breakfast is taken care of which means the year is off to a brilliant “strata”. Generously butter a medium oven-safe baking dish (mine was 9×7) and set aside. Heat a few tablespoons of oil in a medium saucepan set over medium heat. 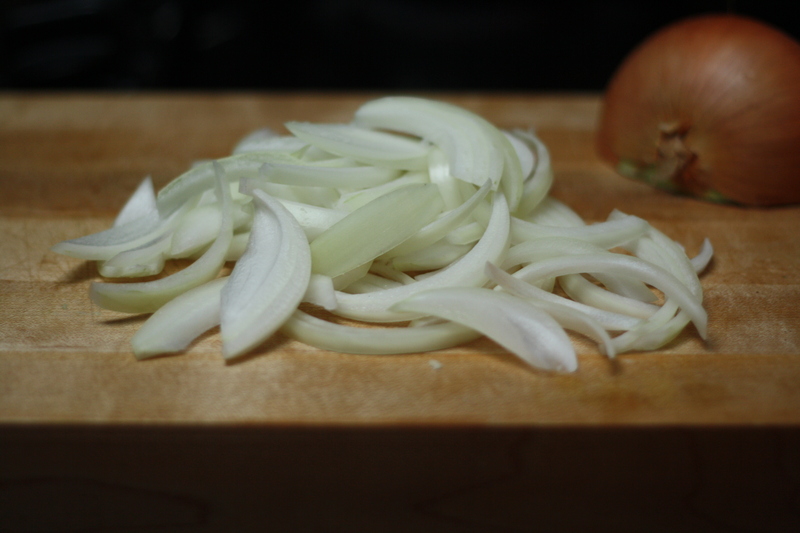 Add the sliced onions, cover, and cook for about 10-15 minutes. Uncover, turn up the heat to medium high, and add the salt and sugar (this helps the onions to caramelize) then cook for another 10-15 minutes, stirring often, until the onions have caramelized and turned a deep, golden brown. Remove from the pan and set aside until ready to assemble the strata. Prepare the ingredients for the filling and have them at the ready. In a large bowl whisk together the milk, eggs, chopped parsley, and a generous pinch of salt and pepper. Working in several batches, dunk the cubed bread into the egg mixture so that each cube is just coated. 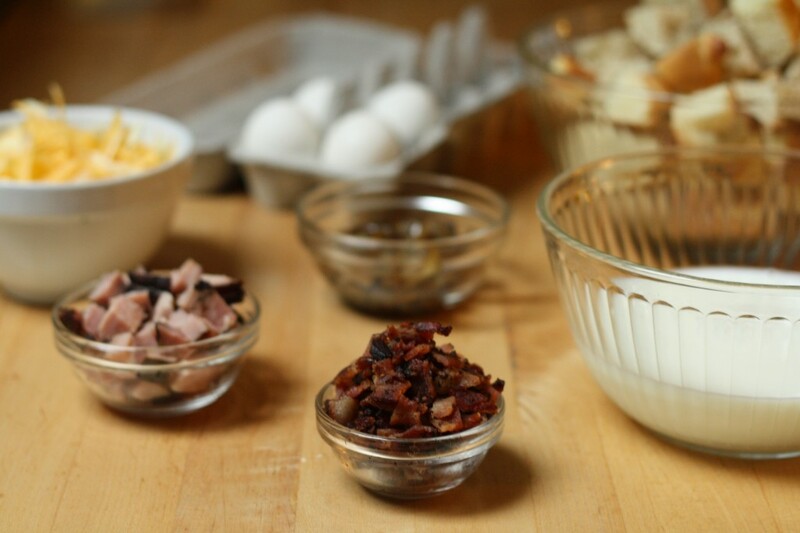 Spread an even layer of the coated bread into the bottom of the buttered dish and evenly sprinkle the caramelized onions, ham, bacon and cheese over the top. Continue layering until all the bread and filling ingredients have been used – ending with cheese. Pour any extra egg mixture over the top of the strata. Tightly wrap with several layers of plastic wrap and refrigerate for at least eight hours, or overnight. The next morning when you are ready to bake, preheat the oven to 350. Unwrap the strata, sprinkle with an additional handful of shredded cheese and bake for 45-55 minutes or until the top is brown and the cheese is bubbling. Let cool for several minutes and serve. This looks comforting and delicious. OMG! 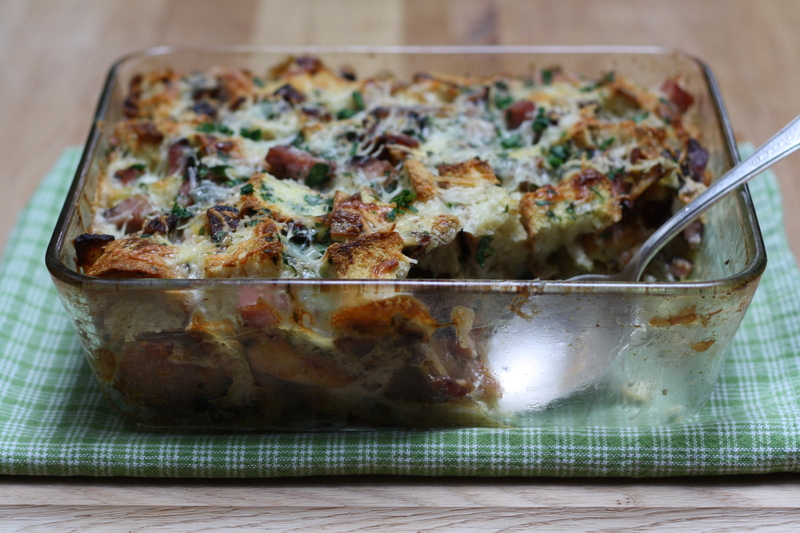 I was just thinking about a strata…really! Such a great “make ahead/finish later” while you’re popping a cork or two. I better get started if I want this in the morning. Happy New Year! Yum. Dude, that looks delicious. I want that for breakfast, pan on lap, eating with a giant spoon, whilst watching Arthur on the couch in a onesy. I’m in a fragile state right now. OMG! Haha! What a most excellent pun! Good trick for caramelizing onions! I will use it in my recipes. You can check out my blog!